Cycas siamensis, female plant, in ChiangMai, Thailand. Origin and Habitat: Central Thailand and Vietnam in central plateau region from Buon Ma Thuot to Pleiku (Dac Lac and Kon Tum), with a disjunct occurrence in Thanh Hoa and Nghe An provinces in the north. Also Laos, Cambodia, Myanmar (Burma). Plants recorded from China (southern Guangxi) probably belongs to Cycas balansae. This species is widespread and locally extremely abundant but very slow growing (generation length estimated to be 120 years) . Altitude range: 300 to 1200 metres above sea level. Habitat: It is a widespread and locally extremely abundant species, it is found in many places in dry open deciduous forest on poor rocky soil. This species occurs in full sun to light shade on flat country or on low hills, often in dense stands. Host woodland is often dominated by Dipterocarpus tuberculatus with a wide range of associated trees such as Erythrina and Bombax. These woodlands are characteristically seasonally wet and dry with the monsoon weather patterns of the region, with particularly pronounced and extended dry periods. The humid and rainy season is warm and followed by a hot season of drought. This vegetation is fire prone. In Thailand plants grow on limestone derived soils and in crevices of limestone boulders. In Viet Nam plants grow on sandy, rocky soil in disturbed grassland or in the understorey of dry, rocky, open forest. C. siamensis is threatended due to forest clearing for agricultural purposes and this has drastically reduced available habitat. Furthermore, too frequent fires are also having an effect on the habitat. This species has also been over-collected to be sold as ornamentals. Although its habitat is continually being reduced, large populations remain, and it is not under any immediate threat of extinction. Epicycas siamensis (Miq.) de Laub. Cycas aurea hort. ex J.Schust. Cycas cochinchinensis Warb. ex J.Schust. Description: Cycas siamensis is a short stemmed, unisexual, dioecious, palm-like plant with a swollen trunk and an attractive crown. 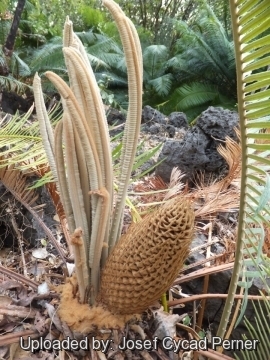 C. siamensis is of similar character to Cycas circinalis in some respects, but darker in color, and the leaves more upright in growth, and it also appears to be a more rapid grower. The leaves (fronds) are pinnately compound, with a very short petiole and basal leaflets gradually reducing in size towards the spines. The the megasporophylls (female reproductive parts) are terminal crowded and reminiscent of those of the Cycas pectinata complex, although smaller in all respects. They also differ in being usually densely brown-tomentose, with the tomentum persisting around their bases and on the trunk around the persistent leaf-bases. Plants vary in colour from white through yellow, orange to brown, depending on the colour of the hairs on the leaves. There are no other clear distinguishing features, and they must all be regarded as the same species. 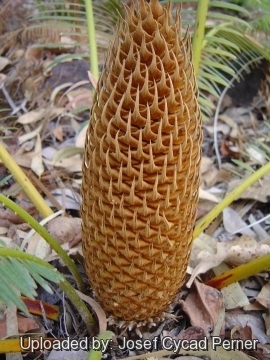 Male cones are smaller than those of the Cycas pectinata complex, and of a distinct oblong shape. The seeds are yellow to orange. Derivation of specifis name From the occurrence in Thailand, known as the Kingdom of Siam when this species was described. 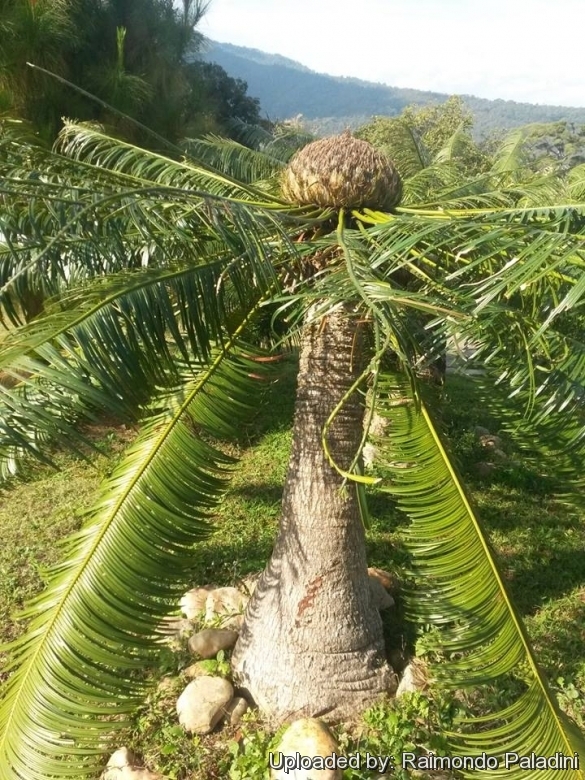 The name C. siamensis has been widely misapplied to Cycas clivicola in southern Thailand and Malaysia, and was misapplied to Cycas balansae in southern China. Stem (trunk): Short very slow growing, bulb-shaped, partly subterranean to arborescent 50-100(-150) cm tall, 14-20 cm diameter, at narrowest point with overlapping leaf bases for protection. The trunk has a wrinkled bark and red-brown tomentum at the leaf base. It has a well marked bulbous base, often becoming broad and plate-like in older individuals. Often the plants reach reproductive maturity before any aerial stem is developed. Leaves: Annually deciduous, crowded at the end of the stem, pinnate, 60-120 cm long, but occasianally up to (perhaps) 2 metres or more. Petioles 11-31 cm long pubescent, spiny. Leaflets (80-)120-240(-280) on each side of the stiff rachis, 2-18 cm long, 5-8 mm wide, acute and spinescent, strongly discolorous, shiny above, glabrescent beneath, slightly recurved along the margin, opposing leaflets inserted at 170-180° on the rachis, flat (not keeled) in section with a very short petiole and basal leaflets gradually reducing in size towards the spines. Rachis frequently terminated by a spine 1-18 mm long. The fronds also are usually densely brown-tomentose, with the tomentum persisting around their bases and on the trunk around the persistent leaf-bases. The leaves are usually dark green, semiglossy, but vary in colour from white through yellow, orange to brown, depending on the colour of the persistent hairs above and below on the leaves. There are no other clear distinguishing features, and they must all be regarded as the same species. The woolly white form is often sold as "Silver" or "Thai Silver" form. Cataphylls: The cataphylls (Modified leaf, much reduced and thickened, serving to protect the apical meristem in cycads produced in flushes preceding the emergence of cones or leaves.) are linear, pungent, pilose, 60-70 mm long and persistent. 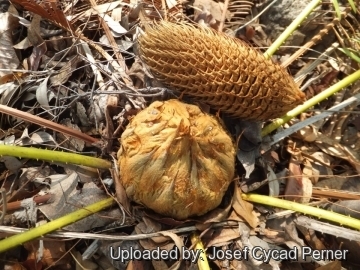 Male cones: Small of a distinct ovate-oblong shape, orange to brown, 10-24(-30) cm long, (4-)5-7.5(-8) cm in diameter, microsporphylls ovate-rhomboid, acuminate-caudate, yellow-lanate, 1-2.5 cm long, 11-17 mm wide, fertile zone 13-22 mm long, sterile apex 5-8 mm long, level, apical spine prominent, sharply upturned, 7-14 mm long. 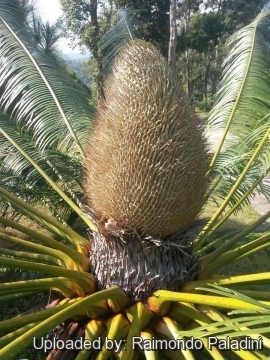 Megasporphylls: Like other Cycas species, the female plants do not bear cones; instead they carry ovules and seeds on 8-10 cm long megasporphylls, the apical portion of them enlarged, rhomboid, 3-6 cm long and wide, reddish-brown, lanate, the distal half pectinate along the margin, ovules 2-4 on each side of the stalk, glabrous. Seeds: Subglobose to ovoid (20-)30-37 mm long, (18-)26-37 mm across. Sarcotesta golden-yellow, not pruinose, 2-3 mm thick; yellow; fibrous layer present; sclerotesta smooth. Spongy endocarp absent. Cycas siamensis Miq. : is a short stemmed cicads with densely brown-tomentose megasporophylls. Plants vary in colour from white through yellow, orange to brown, depending on the colour of the hairs on the leaves. The seeds are yellow to orange. Distribution: Thailand, Vietnam, Laos, Cambodia, Myanmar (Burma). Cycas siamensis '' silver form '': has emergent leaves more silvery-grey than the standard species. The leaves retain much of this colouring over time. Distribution: Thailand, Vietnam, Laos, Cambogia and Myanmar (Burma). Notes: Although most Cycas are, palm-like evergreen plants, Cycas siamensis and Cycas media are said to be regularly deciduous in nature and lose all their leaves before a new flush develops. 3) Whitelock, Loran M., "The Cycads", Timber press, 2002. 4) Nguyen, H.T. 2010. Cycas siamensis. The IUCN Red List of Threatened Species. Version 2015.2. <www.iucnredlist.org>. Downloaded on 28 August 2015. 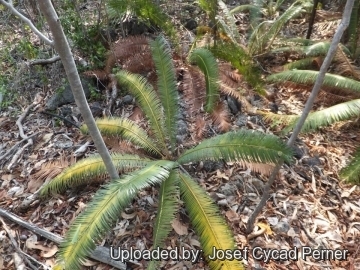 5) Haynes J.L, "World List of Cycads: A Historical Review", IUCN/SSC Cycad Specialist Group, 2012. 6) Osborne, R.; Hill, K.D. ; Nguyen, H.T. & Phan Ke, L. “Cycads of Vietnam.” Osborne, Brisbane (Australia) and Eeden, Capre Town (South Africa) 2007. 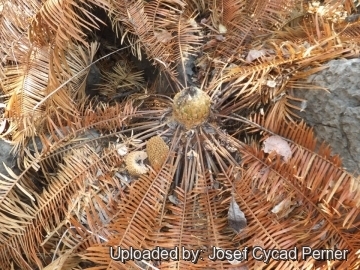 7) Jones, D. L. "Cycads of the world." Smithsonian Institution Press, Washington, DC 2002. 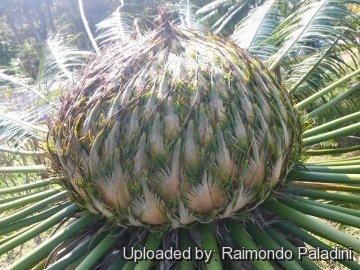 Cultivation and Propagation: Siamese cycad is Cycas siamensis is suited to tropical regions which have a seasonally dry climate. It is easy to grow, tolerating dry periods. Growth rate: Usually slow growing, however good conditions can speed it up considerably. Because of its growth habit, fertilize only when terminal bud begins to swell, indicating the start of the annual growth cycle. Seedling plants of C. siamensis with good treatment become nice looking specimens in 15 cm pots in about two years, and at this stage of growth seem to throw up leaves in succession rather than in the form of an annual growth as commonly seen among this class of plants. Traditional uses: Young succulent leaves of various species, e.g. 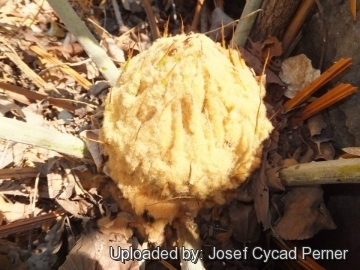 Cycas circinalis, Cycas pectinata, Cycas rumphii, and Cycas siamensis, are often cooked as vegetables in Assam, Malaya, Philippines, Aru and Key Islands, parts of Indonesia and the Moluccas. A starch obtained from the trunk and root is used to tortillas, tamales, soup and porridge. However, consumption of the flour may result in a neurological disorder because of the neurotoxins content. The plant was also used for the treatment of skin complaints, wounds, ulcers, sores, and boils. The seed is poisonous. Propagation: Seed. As a slow growing plant, the seed can take from 6–18 months to germinate. After fertile seeds are collected, they usually need several months of storage before the inner embryo is ready to germinate. Therefore, it is best to clean the seeds of external fruit and set them aside before attempting to propagate the seeds.